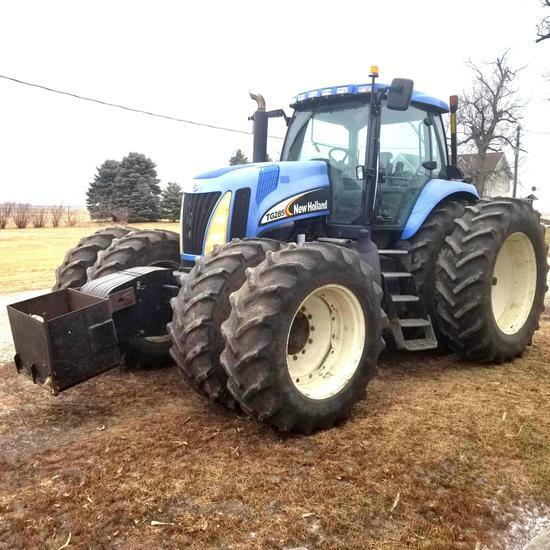 Tractors, Farm Machinery, Combine, 4 Wheelers, etc. PLEASE READ THESE TERMS CAREFULLY, AS THEY ARE A LEGALLY BINDING CONTRACT BETWEEN ALL BIDDERS WITH IOWA AUCTION GROUP. Iowa Auction group (IAG) have put forth every effort in preparing the catalog(s) to accurately describe each item. Printed or verbal statements made by staff are matters of opinion, and are made in good faith. All items are sold As Is, Where Is, and No Returns allowed. Buyers are responsible for conducting their own inspection during open house/inspection periods, and no allowance will be made for inadvertent errors in cataloging, authenticity, or imperfections not specifically noted. All sales are final ~ a bid is a legally binding contract between purchaser and IAG. The auction companies reserves the right to reject any and all bids for any reason. IAG will not be held responsible in the event of any type of internet/computer malfunction while an auction is in progress. Buyer Premium: The buyers premium listed above will apply to all winning online bidders. All accounts must be settled by the end of the pick-up day. Payment must be made with Cash, Valid check, VISA or Master Card, Cashier's check, Money order, or Wired funds. A 3.5% facilitation fee will be assessed to credit card purchases. Checkbacks on credit cards are not allowed. SHIPPING: We encourage buyers to pick up items purchased at the specified pick-up time(s), however we can arrange for packing and shipping through the United States Postal Service or United Parcel Service, subject to a $20/lot facilitation fee (for toy auctions the handling fee/ facilitation fee for shipping will be 3-5 dollars per lot). Packing and shipping costs are the responsibility of the buyer. Because our priority is to deliver your purchase in excellent condition, fragile or large items will be shipped by a professional shipping company and may result in higher shipping costs. All items will be insured for the purchase price at the bidder’s expense. If payment is not received by the end of pick-up day, accounts due will be charged to your credit card, subject to a 3.5% facilitation fee. Purchases not settled by this time are considered in default. Any merchandise in default, and/or remaining at auction site after pick-up date, are considered forfeited, and will become the property of IAG, and the purchaser will be charged a $20.00(+) per item disposal fee. No refunds will be given. All bidders must provide their name, address, daytime phone number, and email address at which they can be contacted, to insure adequate communication between IAG, and their purchasers throughout any transaction. General Information: The auctioneer has the sole discretion to advance and/or reject any bids, should it in his estimation prove injurious to the auction. The auctioneer shall be the final judge in any bidding disputes, and has final authority to name a bidder as the final purchaser. The auctioneer or auction company shall not be held responsible for any 'missed' or unseen bids. IAG reserve the right to alter this agreement at any time. This will take place by updating this site. Please check back and review auction terms often, as every time you use this site you are agreeing to the terms as they are written at that time. IAG reserve the right to refuse service to any person, or to cancel any auction at any time for any reason. The purchaser agrees to pay all reasonable attorney fees and costs incurred by IAG in the collection of funds owed. The purchaser also agrees that a fee of 2% per month be added to any unpaid balance due the auction company, as well as any other costs or losses incurred due to the purchasers failure to adhere to these terms. Any debt collection or dispute proceedings will be settled by arbitration in Sioux County, Iowa. BIDDER RESPONSIBILITIES INCLUDE, BUT ARE NOT LIMITED, TO: 1. Bidders agree to keep their username and password confidential as they are responsible for ANY and ALL activity involving their account. 2. When using the web site, bidders must obey any and all local state and federal laws. Violations will result in termination of web site use privileges. 3. Auction company employees and/or auction company may bid on auction items. 4. Item descriptions and photographs are not to be used in lieu of personal inspection of any item. ALL SALES ARE FINAL. 5. Please bring loading assistants with you. Some items may require disassembly. Please bring adequate tools and equipment with you. Sprayer Specialties V-1010 XLM Pull Type Sprayer w/1000 gal. Poly Tank, Hyd. Pump, Hydraulic X-Fold 3 Section 60' boom, Adjustable Tread, 12.4x42 Tires, Raven switch controller. Gnuse 3 Point 48" Pallet Forks, Model F-40, 4000 lb. capacity. Sudenga 8"x26' Truck Auger Electric Drive w/5hp 220v motor, Low Profile Hopper. Brandt 10"x57' Grain Auger, 540 Pto Direct Drive, Hydraulic Lift, Hyd Drive Swinging Hopper. EZ Trail 510 Grain Cart 500b. EZ Trail 510 Grain Cart 500b Side Auger, 18.4 - 26 Diamond Tires, 1000 Pto, Hyd Fold and Flow Auger ser.#J81573. Brent 540 Gravity Box w/Brent Gear, 425/65R22.5 Tires, Green, New Rear Brakes, Lights, Will have New Box Extensions & Extend-a-Tongue. Parker 2600 Gravity Wagon w/Westendorf 12 ton Gear, Square Extend-a-Tongue, 11R22.5 Truck tires, 400 bushel capacity. Parker Gravity Box w/Parker Gear, 12.5L-15SL Tires, 300 Bushel Capacity. Parker Gravity Box w/ 8 Bolt Westendorf Gear, 12.5L-16 tires, 300 Bushel Capacity. KillBros 350 bushel Gravity Box w/ KillBros 12 ton Gear, Extend-a-Tongure, 12.5L-15SL Tires. KillBros 350 bushel Gravity Box w/ John Deere Gear, Extend-a-Tongue, 12.5L-15SL Tires.